Jonathon Dodson, in his book, Gospel-Centered Discipleship*, says, “churches today have more in common with shopping malls, fortresses, and cemeteries than they do the church of the New Testament. They have become consumerist, doctrinaire, lifeless institutions, not Jesus-centered missional communities”. Dodson goes on to correct this approach toward the gospel, saying, “when we are converted, we not converted to Christ alone…It is also important to consider what man is converted to. When we are converted, we are converted [to three things:] to Christ, to church, and to mission”. What Dodson wishes to communicate here is that often churches preach a gospel that is all about individual conversion rather than Christ, his people, and his mission. Often, churches cater only to the personal experience of salvation. But the gospel is so much more than that. When we are redeemed by Jesus, we are not simply saved from our sin to Christ — we are also saved to Christ’s people and to His mission. Dodson calls this a three part of conversion: we are converted to Christ personally, to the church communally, and to Christ’s mission vocationally. And he says, the gospel by nature entails all three of these things; not just to one-third of the gospel. “Failure to convert to the church and to mission is a failure to grasp the [entire] gospel”. Dodson talks about conversion to Christ’s people: “The gospel reconciles people to God [but also] to one another, creating a single new community comprised of an array of cultures and languages to make one new humanity”. It is important to realize that when we are joined to Christ through faith, that we are also joined to one another. Peter says that the church of Christ is like a temple of “living stones…being built up as a spiritual house, to be a holy priesthood” (1 Peter 2:4-5). Peter gives the imagery of a temple, being built on Christ as the cornerstone (1 Pet 2:6). And each person placed on the Cornerstone is also placed next to one another. And we cannot be the temple that God has called us to be unless we are converted to one another! We are meant to live for Jesus with each other. But also, as we are converted to Jesus and to his people, we are also converted together to his mission. Jesus has a mission, and he has given us the task of accomplishing it. Dodson says that “when anyone becomes a disciple of Christ, the temple expands and a living stone is added. [And] God’s grand plan, from the beginning, was for the garden-temple of Eden to expand throughout the whole world, to be populated with new stones who worship Jesus Christ, the great Cornerstone”. As living stones, we as participants in Christ’s kingdom now go out to continue to populate his glorious temple, made of peoples from all nations. This is indeed the church’s mission: to be ever expanding, ever heralding Christ’s redemptive work on earth, and declaring that He is King. “When we believe the gospel, we are converted three times”, not just once. We are given to Christ, to his people, and to his mission. 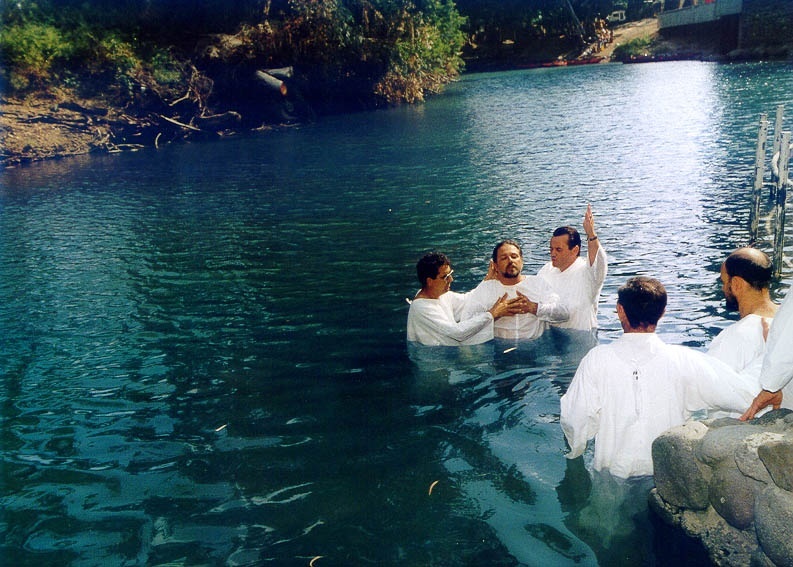 Dodson says that the primary reason for baptism is to express publicly our acceptance and understanding of the gospel. He says that baptism is a means to illustrate and express that by faith, “Jesus’ death and resurrection becomes our death and resurrection…it signifies our identification with Christ in his death as we are lowered into his ‘watery grave’, and identification with his life, where we are raised up into his resurrection life”. In that sense, baptism then is not merely a public ceremony of sorts, but rather a public confession of the gospel. This is in fact what Paul says, that “we were buried therefore with him by baptism into death, in order that, just as Christ was raised from the dead by the glory of the Father, we too might walk in newness of life” (Rom 6:4). Baptism then becomes this public declaration that we have died with Christ, and live a new life in Him. Dodson continues with a second purpose found in baptism. He says, “second, we are baptized into two overlapping communities. The first is the divine community of the Trinity: ‘Baptizing them in the name of the Father and of the Son and of the Holy Spirit (Matt 28:19). The second community is the church: ‘For in one Spirit we were baptized into one body’ (1 Cor 12:13). Baptism results in our participation in a new, spiritual family–the family of the Trinity”. Baptism then is not only a public confession of the gospel, but also a public identification with the Triune God and his people. It is a joining with the divine community, and becoming one family in Jesus. Peter goes so far as to say that this one corporate body is like a temple, built together as one, and founded on the cornerstone, Jesus Christ (1 Peter 2:5). In this way, baptism is not merely a private matter, but a corporate celebration and adoption. Lastly, Dodson says that baptism is about mission. This was something new for me to think on. As a person that has identified themselves with Christ, and with his body, they are missionaries for Jesus (John 20:21, Mt 28:18-20). This becomes part of their identity. Dodson says, “baptism is missional because it is the outcome of obedience to the Great Commission”. This is very true! Jesus sent his disciples out, commanding them to share the message of Jesus and to baptize disciples (Mt 28:19). Dodson gives good insight to this, saying, “in a sense [then], baptism is the end of the Great Commission and, at the same time, it is its beginning. Baptism begins our participation in the wonderful gospel mission. Whenever someone is baptized, another disciple is sent in the power and authority of Jesus to join the mission of making disciples…”. In this sense then, baptism fulfills Matthew 28, and also starts the process over again! As a new believer emerges from the water, they are identifying themselves with the mission of Jesus and his church. I think this is an excellent summary of the purpose and power found in public baptism. In baptism, the Christian identifies himself with the gospel, the community of the gospel, and the mission of the gospel.